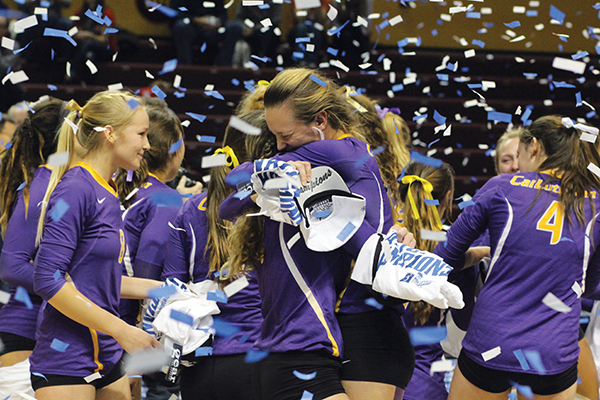 During Cal Lutheran’s 25th year in National Collegiate Athletic Association Division III competition, and on the third championship match appearance in the history of the volleyball program, the Regals brought home the university’s first NCAA title in a team sport. Head coach Kellee Roesel’s Regals played the last matches of 2015 in front of family, roommates, former players and other Cal Lutheran die-hards, whose painted-purple enthusiasm was noticed by the announcers on NCAA.com live-streaming broadcasts. Off the court, the team felt the love via Instagram, Twitter, Facebook and Snapchat mobile messaging. On the sideline, during breaks and timeouts, they danced. The three-set championship win over the Wittenberg Tigers was notably one-sided (25-23, 25-18, 25-16), against a highly respected opponent and one day after Cal Lutheran needed five sets to survive the semifinal against Carthage College. Senior outside hitter Allie Eason led the attack in the final match, serving back-to-back aces during a six-point run that gave the team a 16-12 first-set advantage. For the day, she had 13 kills and eight digs. On the strength of sophomore setter Jamie Smith’s 34 assists, junior Monica Lundgren had nine kills and Lawrence (suffering from the flu) had eight. Amanda Roberts, a freshman, had 14 digs. For the tournament, Eason was named Most Outstanding Player. She was joined on the NCAA all-tournament team by Lawrence and junior Nicki Tetherow, a defensive specialist who contributed vocal leadership and saves, including 27 digs in the thrilling semifinal. The championship match, where things came together, was in many ways the culmination of years of effort. Some of the current Regals played on an equally great 2013 team that came one point from winning the championship. The volleyball team is now on a six-year streak as the SCIAC conference champion. It is well-positioned to continue the run, with only two seniors set to graduate in May. Like the 2013 squad, this national champion team has been able to share the load among players and to perform under pressure. With her team trailing in the fourth set of the Nov. 20 semifinal, Roesel subbed in senior Pua Mo’okini-Oliveira and sophomore Mikayla Dobson cold off the bench, and the pair combined for two crucial kills. Lawrence also elevated her game for the fourth and fifth sets, as she, Eason and Roberts each recorded a double-double for the match in kills and digs. Unofficially, the championship match was a Regals team-building challenge. Every season, under one of four rotating themes, assistant coach Kevin Judd plans activities around the full schedule of home and away games. 2015 featured his scaled-down version of CBS Television’s Amazing Race, in which pairs of contestants complete timed challenges. In Michigan, some women on the volleyball team took icy plunges in the Grand River as part of the fun. On the morning of the championship match, they converged in pairs on Rosa Parks Circle in search of Cal Lutheran President Chris Kimball, who was waiting with instructions for the next-to-last team-building challenge. For that challenge, one woman from every pair had to write a five-item list in the snow from memory: the mascots of the five opponents that the Regals had beaten in single-elimination play, since regionals, in order to make it to the NCAA final. In the end, Nov. 21 was an amazing day for the “race.” For the first time, Judd included an NCAA match as a team-building event. The challenge was to win. So when the players accepted their individual NCAA championship trophies that night, they stood on a themed banner laid out by the assistant coach to signify completion of the race’s final leg. Several of the team members, including Eason and Tetherow, view themselves as ambassadors for Division III sports, often recommending this scholar-athlete’s path to younger players in their club volleyball coaching. You work as hard as any top college athlete, they say, but your sport is not a job. It’s more of a major volunteer commitment: You give up on free time. You support other athletes, go to games, learn about water polo. In the off-season, you play intramural sports with friends. Or study abroad. When Eason was in high school, she first imagined herself playing NCAA Division I. But she also had academic aptitude and a long-standing fascination with “the way that we think, and why we do the things that we do, and what motivates us” in both sports and daily life. On the plane ride home from Michigan, among other opportunities, the team members spent their time studying. Tetherow said that Cal Lutheran’s primary focus on academics has helped her in life. She’s needed her grades in order to keep playing, and the grades haven’t always come easily. A junior in marketing communication, she pictures herself in a fundraising and outreach role at a nonprofit, possibly for Alzheimer’s research.